Drawing 17 shows the east (entrance) and south fronts with the proposed bow front. 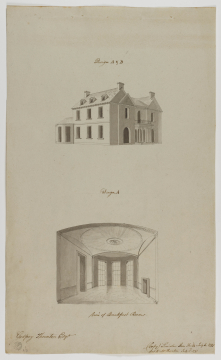 The interior perspective of the breakfast room shows it lit by a bow with three full length windows and having a shallow canopy ceiling whose reeded saucer dome has a sunken central recess holding a patera. The breakfast room scheme was not carried out.